The POV Dispatch is our Autodesk internal newsletter, published monthly, where we discuss the big ideas that are important to us and our customers. It is published by our Corporate Strategy & Engagement (CS&E) team of which Autodesk Labs is a part. Jon Pittman is the VP of CS&E, so it should come as no surprise that Jon routinely makes submissions to issues of the POV Dispatch. Jon is also a Lecturer at the Haas School of Business of the University of California at Berkeley. Jon contributed this book review to a recent issue, and I thought I would share it with you. The Second Machine Age: Work, Progress, and Prosperity in a Time of Brilliant Technologies is a great book — and one that is very timely. The authors are MIT economists who have been at the forefront of the debate about the structural changes to our economy and our world caused by technological progress. The fundamental thesis of the book is that we are at the beginning of a second machine age that will affect us as profoundly as did the first machine age. Quality of life and GDP did not really change all that much for tens of thousands of years until the first industrial age — defined by the steam engine. Then society's wealth dramatically increased, as did our standard of living. The authors believe that we are in a second machine age — propelled by digital technology. They assert that exponential technologies, the digitization of everything, and recombinant innovation are creating machine intelligence that will substitute for human mental labor as machinery did for physical labor. Basically, work that is routine or algorithmic in nature will be automated away by digital technologies — robotic or otherwise. The only forms of human labor that will remain — are those requiring emotion and empathy — child care, care of the elderly, personal services such as personal training, coaching, hairdressing, etc. — or those that require the kind of intelligence that machines cannot (at least in the immediate future) replicate — design, innovation, etc. Their short-term suggestion is to use education to create those skills that cannot easily be automated. This is a daunting task, since much of the educational infrastructure and mindset is oriented toward the memorization and mastery of bodies of knowledge and procedures. What we don't do so well is helping people develop judgment and critical thinking. Nevertheless that is the prescription that is required. Their longer-term policy suggestion has to do with how we distribute wealth and reward labor. Here the suggestions are around changes to taxation and even a guaranteed annual income. 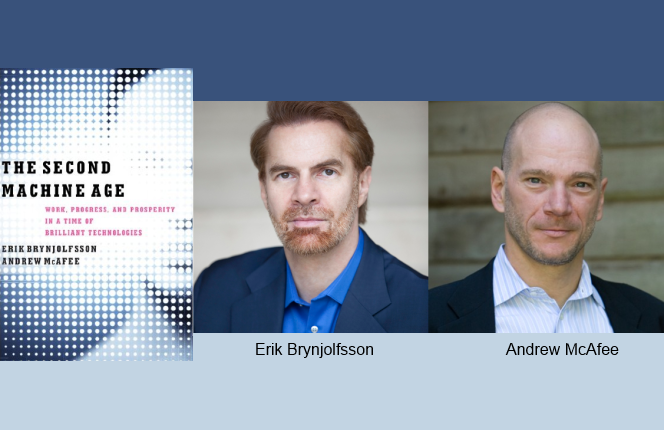 The book very clearly articulates the ideas Brynjolfsson and McAfee have been discussing for several years. It crystallizes their core argument and is a very provocative book that ties together technology, education, and policy in an economics context. It is clearly a book that is written by technology optimists — they believe that technology will address many of the world's problems — but also point out the challenges posed by powerful technologies that amplify the human mind. It is unclear that their solutions are workable — but at least their book is a catalyst for conversation. This is a must-read. The second age is alive in the lab.